This might surprise my college friends, but I'm no longer much of a drinker. One drink gets me tipsy, at one and a half I consider myself officially drunk. At least I'm a cheap date. With New Year's around the corner, though, something bubbly is definitely in order. I don't think I've ever had a Bellini before, but something about it called out to me. 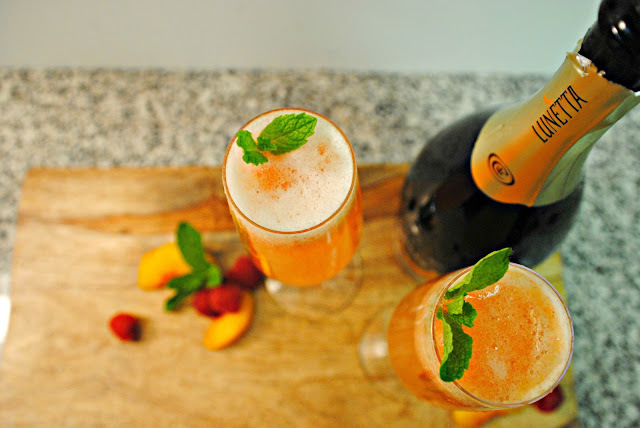 According to GourmetSleuth, the original Bellini was created at Harry's Bar in Venice, Italy and featured white peaches, gently stained ("macchiato") with a little raspberry puree. Well and good, but fresh white peaches are a little thin on the ground in December. Making do with frozen peach slices, I knew I had to jazz it up a bit, so I went for rose water. Steam distilled from fresh rose petals, it packs quite a wallop of genuine rosy fragrance and flavor. In Indian and Middle Eastern cuisine, you tend to find it in cakes, desserts, and lassis but, in my opinion, its one true pairing is with booze. To round out the flavors, I added extra raspberries and a generous swirl of Tupelo honey. The result is appropriately blushing pink with a complex, multi-layered bouquet. 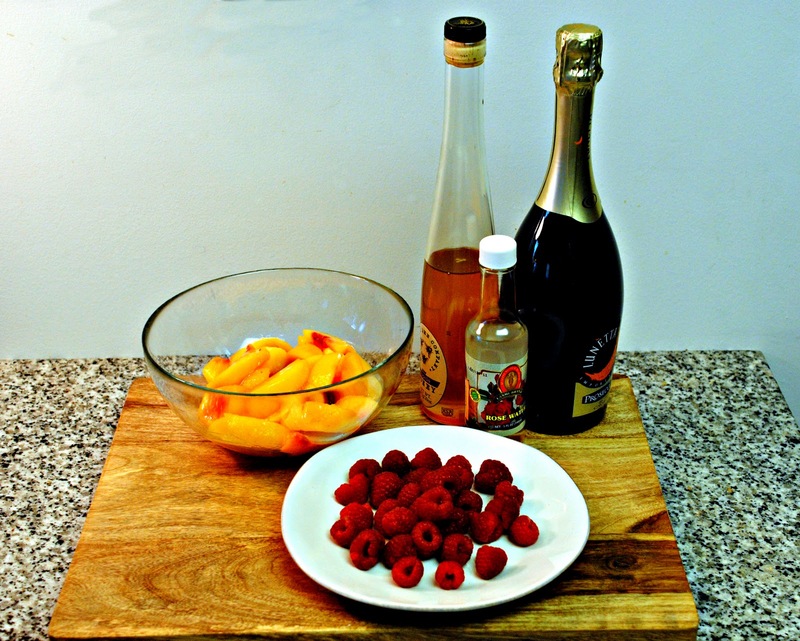 As an added benefit, since you're mixing in fruit, honey, and rose water, you can go for a cheaper wine. The fine qualities of the good stuff would be overpowered, so anything with alcohol and bubbles (that you can still bear to drink) fits the bill. 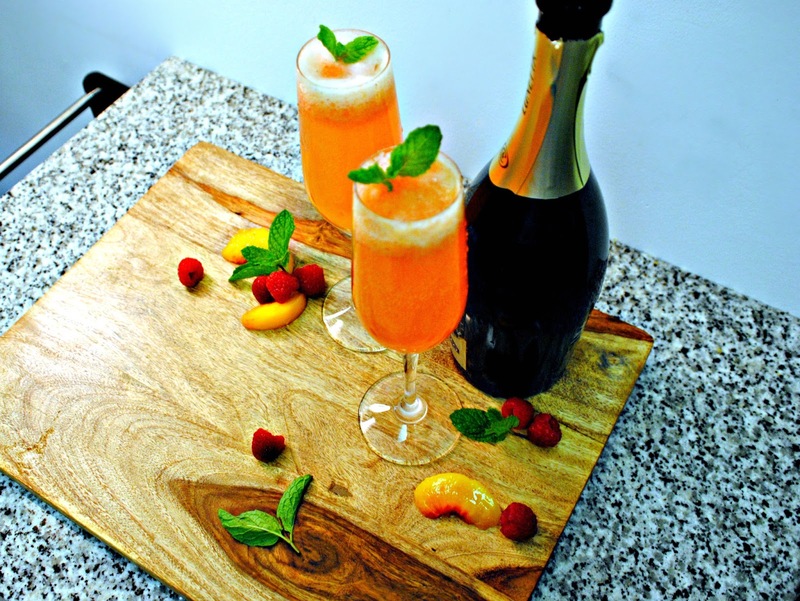 In honor of the drink's Italian origins, I suggest prosecco or Asti Spumante Brut. 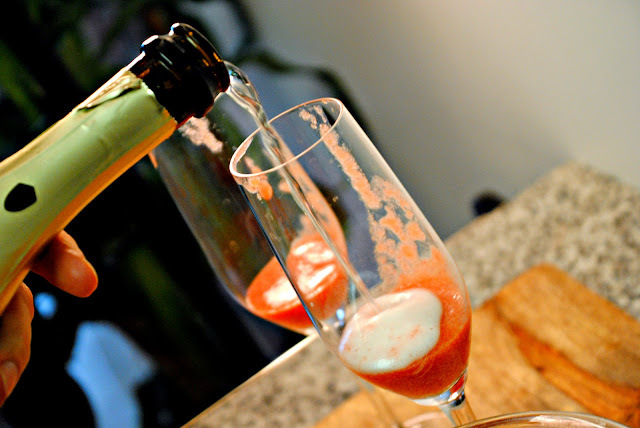 Prosecco is, in essence, "Italian champagne." Since only the sparkling wines made in the Champagne region of France truly merit that designation, prosecco is the way to go. You can make this in individual glasses or by the pitcher. In the case of the latter, throw in some "dusty-looking" green grapes, fresh from the bag. That white film is yeast and it helps keep the bubbles going. Add the rose water to the honey (I mixed mine right in the measuring cup) and stir together until homogenized. 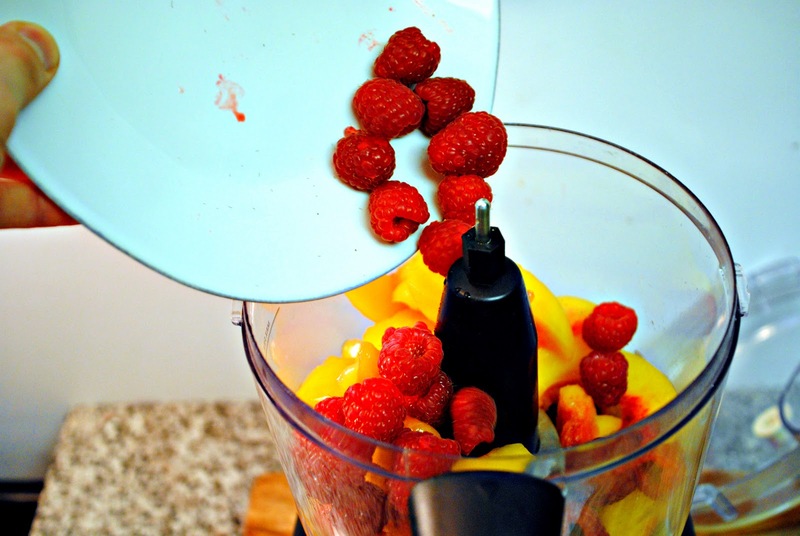 Then pour the resulting rosy honey into a food processor fitted with the standard blade attachment, adding the peaches and raspberries. 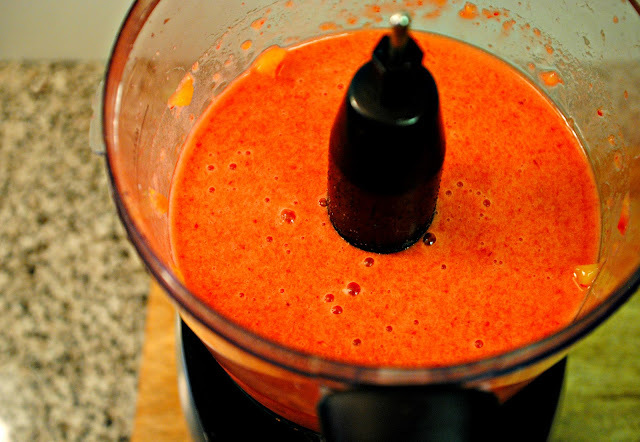 Whirl until pureed. 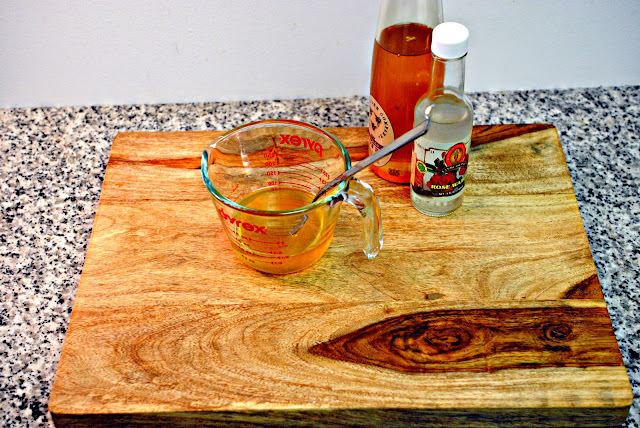 Scrape down the sides with a rubber spatula and give it a few more pulses to even things out. Place a fine-mesh sieve over a medium bowl and strain the puree to remove the seeds. If your strainer is like mine, this actually takes some doing. Grab that trusty rubber spatula and use it to stir, mash, and scrape against the sides of the sieve to help push the mixture through. From here, you can reserve the strained puree in the refrigerator for a few days, or proceed straight to the finale. Scoop 2 tbs of puree into individual glasses and top with sparkling wine, swirling with a cocktail stirrer to mix, or combine the lot in a large pitcher. Serve garnished with more peach slices, raspberries, or fresh mint leaves. What a beautiful picture! have a happy new year! here from foodepix - this looks just great, thx for the recipe! Hi Beti and Trish! Thanks so much for the kind compliments. I hope you had spectacular New Year's Eves. My 3-year old nephew, Benjamin, insisted on staying up with us to watch the ball drop. The smile on his face when we all started cheersing him was priceless.